Since China passed its first environmental-protection law in 1979, it has produced an extensive body of regulations to protect its air and water and the health of its people. But even as the law books expand, the country's pollution worsens. To many local officials, for whom developing the economy is the first priority, those rules might as well not exist. "From a traditional perspective, China isn't completely a nation of laws," says Wang Canfa, director of the Beijing-based Center for Legal Assistance to Pollution Victims. "So when it comes to environmental protection [laws]," some local officials wonder: "What kind of law is this?" 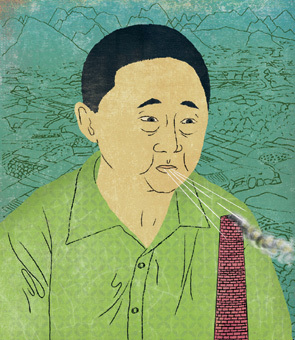 For the past eight years, Wang's group has used the courts to teach wayward officials and unscrupulous businessmen just what environmental law is. The center's volunteer attorneys file lawsuits to help people whose lives and livelihoods have been damaged by the toxic byproducts of China's breakneck expansion. Since starting in early 1999, the center has logged more than 10,000 calls and pursued over 100 cases, some with as many as 1,700 plaintiffs. Though the center loses about as many cases as it wins, it has managed to pull off some noteworthy victories. Its attorneys blocked an animal-testing lab from opening in a Beijing residential neighborhood, succeeded in getting a Hebei steel factory accused of pollution to move, and won a $730,000 ruling against a paper mill and chemical plant in Shandong province, after illegal discharges led to massive kills at fish farms. Wang, a professor at the China University of Political Science and Law, runs the center out of a dark, cramped apartment building on campus. "Doing this work isn't easy," he says. "I'm not even 50 years old yet, and people look at me and say, 'You're pushing 60, right?'" He says his biggest frustrations come when local officials attempt to interfere in the judicial process to protect local industries. Anger over unchecked environmental destruction is one of the main sources of rural unrest in China. But even when his clients see justice denied in the courts, Wang urges them to avoid violent protest and continue seeking resolution through the law. "If you use force to solve the problem, the result will only be temporary. Look at Chinese history; there have been so many peasant revolts. They overthrow one emperor, then become just like the old emperor," he says. "When we lose a case, we don't go protest. We appeal and counterappeal. We think of another way, through the law, to win." It's a tortuous process. But when it works, a country that's struggling to make its laws mean the same thing in practice as on paper wins, too.